20, Service on Feb. 20, 1994. Download "20, 1994. Service on Feb. 20, 1994." 1 DEPARTMENT OF AGRICULTURE Agricultural Cooperative Service Agricultural Marketing Service Agricultural Research Service Agricultural Stabilization & Conservation Service Animal & Plant Health Inspection Service Cooperative State Research, Education, & Extension Economic Research Service Economics, Statistics, & Cooperative Service Economic Research Service Farmer Cooperative Service Statistical Reporting Service Economics & Statistics Service Food Safety Inspection Service Foreign Agricultural Service Forest Service Grain Inspection Packers & Stockyards Administration Human Nutrition Information Service National Agricultural Statistics Service Natural Resources Conservation Service Office of International Cooperation & Development Office of Transportation Rural Business-Cooperative Service Rural Development Service Science & Education Administration Agricultural Research Service Cooperative State Research Service National Agricultural Library DEPARTMENT OF COMMERCE Bureau of the Census Economic Development Administration Environmental Science Services Administration Maritime Administration Minority Business Development Agency Although the Agricultural Marketing Service was established in April 1972, fiscal year 1979 was the first year in which Congress appropriated funds to this agency. Data reported for the Agricultural Marketing Service include funds for the Office of Transportation beginning in The Human Nutrition Information Service merged with the Agricultural Research Service on Feb. 20, The Agricultural Stabilization & Conservation Service was abolished as of Oct. 20, The Cooperative State Research Service merged with the Extension Service on Oct. 19, 1994, to become the Cooperative State Research, Education, and Extension Service, due to a reorganization within the Department of Agriculture. Data reported for the Economics, Statistics, & Cooperative Service include programs of the Economic Research Service, the Statistical Reporting Service, and the Farmer Cooperative Service for fiscal years Data reported for the Economics & Statistics Service include programs of the Economic Research Service and the Statistical Reporting Service for fiscal year The Office of International Cooperation & Development became part of the Foreign Agricultural Service (FAS) in June Data reported for FAS include funds appropriated to International Cooperation & Development [more] programs within FAS as of fiscal year The Federal Grain Inspection Service was abolished on Oct. 20, 1994, and its functions were assumed by the Grain Inspection Packers & Stockyards Administration. The Human Nutrition Information Service merged with the Agricultural Research Service on Feb. 20, The Soil Conservation Service was abolished on Oct. 13, 1994, and its functions were assumed by the Natural Resources Conservation Service. The Office of International Cooperation & Development became part of the Foreign Agricultural Service (FAS) in June Data reported for FAS include funds appropriated to International Cooperation & Development [more] programs within FAS as of fiscal year This agency's name changed from the Rural Business & Cooperative Development Service to the Rural Business-Cooperative Service on Jan. 30, In 1981 the Maritime Administration moved from the Department of Commerce to the Department of Transportation. 2 National Fire Prevention & Control Administration National Institute of Standards & Technology National Oceanic & Atmospheric Administration National Technical Information Service National Telecommunications & Information Functions for the National Fire Prevention & Control Administration transferred from the Department of Commerce to the Federal Emergency Management Agency as of Apr. 1, Office of Productivity, Technology, & Innovation Office of Telecommunications Patent & Trademark Office United States Travel & Tourism Administration DEPARTMENT OF DEFENSE Department of the Army, Civil Functions Department of the Army, Military Functions Housing for Military Personnel in R&D Military Construction Pay & Allowances of Military Personnel in R&D RDT&E Appropriation Special Foreign Currency Program Support from Procurement Appropriations Department of the Navy DT&E Support from Operations & Maintenance DT&E Support from Procurement Appropriations Housing for Military Personnel in R&D Military Construction Pay & Allowances of Military Personnel in R&D RDT&E Appropriation Special Foreign Currency Program Department of the Air Force DT&E Support from Operations & Maintenance DT&E Support from Procurement Appropriations Housing for Military Personnel in R&D Military Construction Pay & Allowances of Military Personnel in R&D RDT&E Appropriation Special Foreign Currency Program Defense Agencies Ballistic Missile Defense Organization Defense Advanced Research Projects Agency Defense Information Systems Agency Defense Logistics Agency Defense Special Weapons Agency Joint Staff National Imagery & Mapping Agency Special Operations Command Uniformed Services University of the Health Sciences Washington Headquarters Services The Department of the Army, Civil functions (Corps of Engineers) development activities are appropriated by the Energy & Water Development Act and therefore can't be categorized according to the advanced technology and major systems development breakdown. 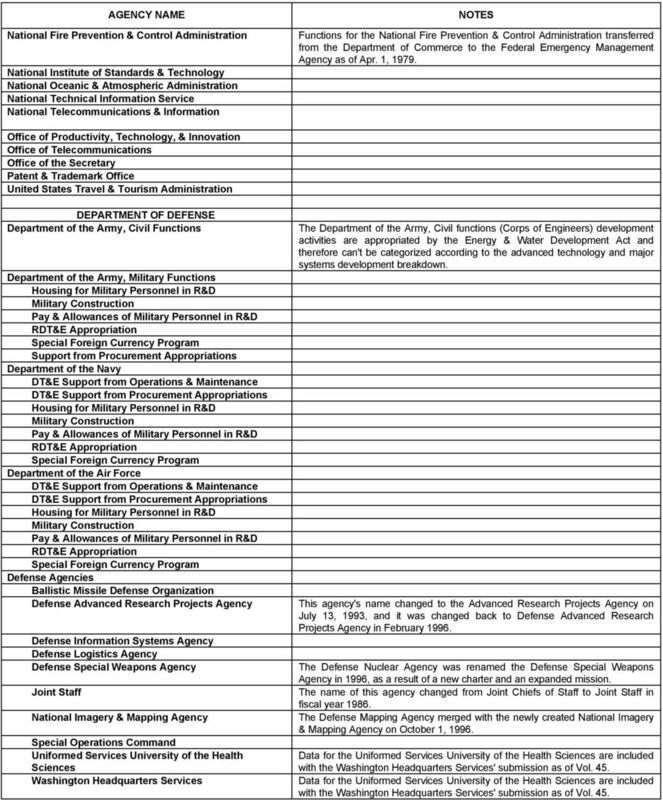 This agency's name changed to the Advanced Research Projects Agency on July 13, 1993, and it was changed back to Defense Advanced Research Projects Agency in February The Defense Nuclear Agency was renamed the Defense Special Weapons Agency in 1996, as a result of a new charter and an expanded mission. The name of this agency changed from Joint Chiefs of Staff to Joint Staff in fiscal year The Defense Mapping Agency merged with the newly created National Imagery & Mapping Agency on October 1, Data for the Uniformed Services University of the Health Sciences are included with the Washington Headquarters Services' submission as of Vol. 45. Data for the Uniformed Services University of the Health Sciences are included with the Washington Headquarters Services' submission as of Vol. 45. 3 Defense Civil Preparedness Agency Health Affairs, Assistant Secretary of Defense for Operational Test & Evaluation, Director Public Law No , Section 1703 makes the of Defense responsible for the Chemical and Biological Defense Program (CBDP). Section 1701 requires the creation of CBDP research, development, test, and evaluation program elements established in the fiscal year President's Budget. Data for these new program elements are included in the Federal funds survey as of Vol. 46. Functions for the Defense Civil Preparedness Agency transferred from the Department of Defense to the Federal Emergency Management Agency on July 20, Test & Evaluation, Deputy Under Secretary of Defense DEPARTMENT OF EDUCATION DEPARTMENT OF ENERGY In 1977 the Energy Research & Development Administration became part of the In fiscal year 1982 the Bonneville Power Administration became part of the DEPARTMENT OF HEALTH, EDUCATION, & WELFARE Alcohol, Drug Abuse, & Mental Health Administration Center for Disease Control Environmental Health Service Food & Drug Administration Health Care Financing Administration Health Resources Administration Health Services Administration Health Services & Mental Health Administration National Institute of Education National Institutes of Health Office of Assistant Secretary for Education Office of the Assistant Secretary for Health Office of Child Development Office of Education Office of Human Development Services Office of International Health Social & Rehabilitation Service Social Security Administration DEPARTMENT OF HEALTH & HUMAN SERVICES Administration on Aging Administration for Children & Families Agency for Health Care Policy & Research Alcohol, Drug Abuse, & Mental Health Administration Centers for Disease Control & Prevention In fiscal year 1991 Human Development Services was replaced by the Administration for Children & Families (ACF) and by the Administration on Aging (AoA). Beginning in fiscal year 1992, data shown for the ACF are separate from obligations for the AoA. Obligations reported for the Administration for Children & Families may be incomplete for fiscal year 1992 due to unavailability of data. 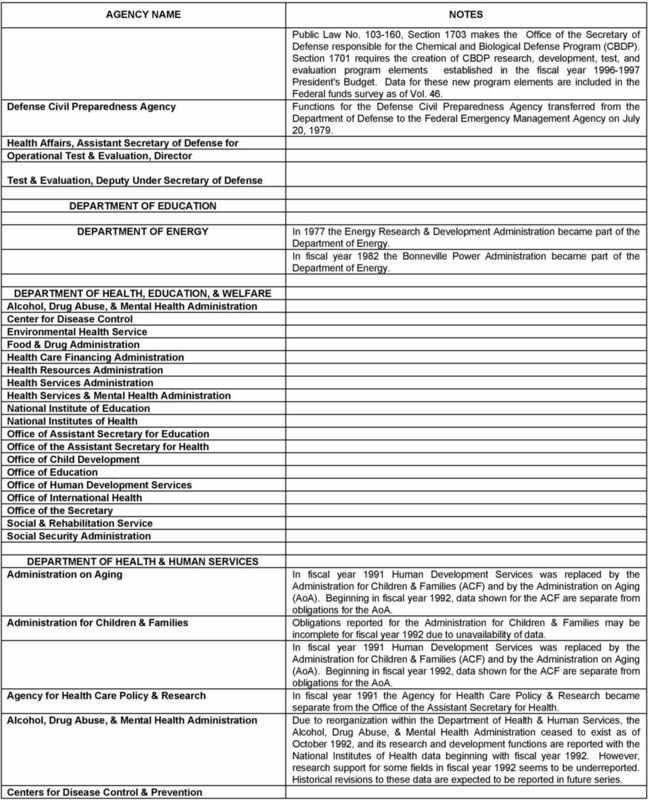 In fiscal year 1991 Human Development Services was replaced by the Administration for Children & Families (ACF) and by the Administration on Aging (AoA). Beginning in fiscal year 1992, data shown for the ACF are separate from obligations for the AoA. In fiscal year 1991 the Agency for Health Care Policy & Research became separate from the Office of the Assistant Secretary for Health. 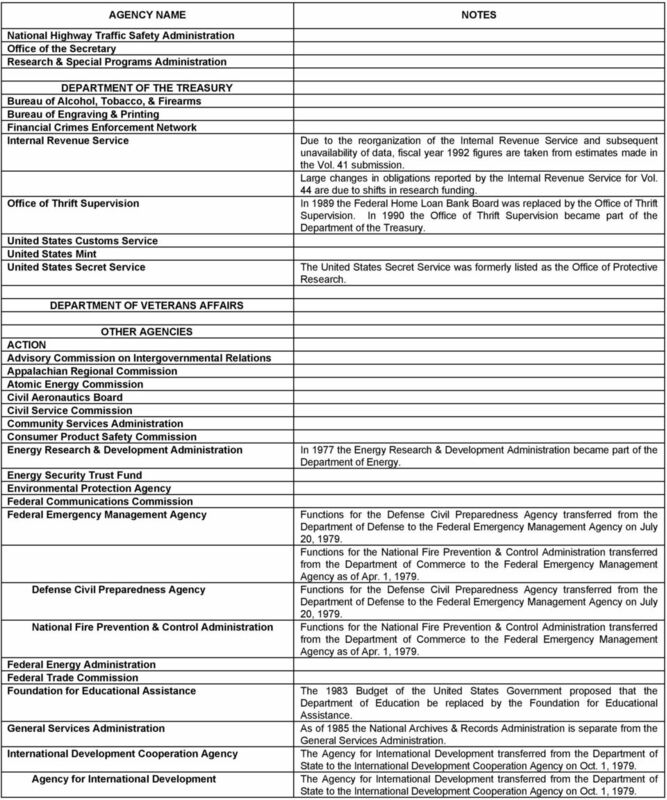 Due to reorganization within the Department of Health & Human Services, the Alcohol, Drug Abuse, & Mental Health Administration ceased to exist as of October 1992, and its research and development functions are reported with the National Institutes of Health data beginning with fiscal year However, research support for some fields in fiscal year 1992 seems to be underreported. Historical revisions to these data are expected to be reported in future series. 4 Food & Drug Administration Health Care Financing Administration Health Resources Administration Health Resources & Services Administration Health Services Administration Human Development Services National Institutes of Health Office of the Assistant Secretary for Health Office of the Asst Secretary, Planning & Evaluation Office of Public Health & Science Social Security Administration Substance Abuse & Mental Health Services In fiscal year 1991 Human Development Services was replaced by the Administration for Children & Families (ACF) and by the Administration on Aging (AoA). Beginning in fiscal year 1992, data shown for the ACF are separate from obligations for the AoA. 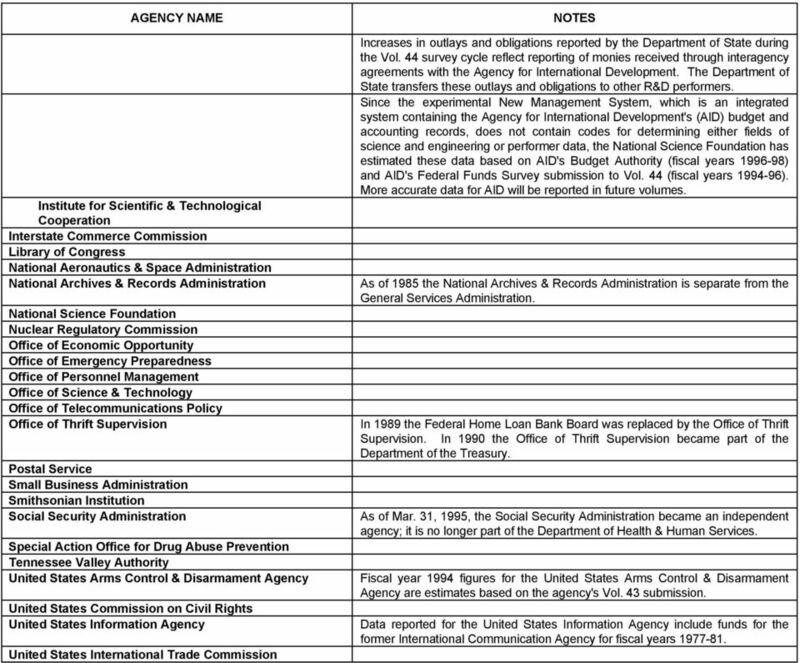 Due to reorganization within the Department of Health & Human Services, the Alcohol, Drug Abuse, & Mental Health Administration ceased to exist as of October 1992, and its research and development functions are reported with the National Institutes of Health data beginning with fiscal year However, research support for some fields in fiscal year 1992 seems to be underreported. Historical revisions to these data are expected to be reported in future series. In fiscal year 1991 the Agency for Health Care Policy & Research became separate from the Office of the Assistant Secretary for Health. DEPARTMENT OF HOUSING & URBAN DEVELOPMENT DEPARTMENT OF THE INTERIOR Bonneville Power Administration Bureau of Land Management Bureau of Mines Bureau of Reclamation Federal Water Pollution Control Administration Geological Survey Heritage Conservation & Recreation Service Minerals Management Service National Biological Service National Park Service National Resources Library Office of Coal Research Office of Surface Mining Reclamation & Enforcement Office of Water Research & Technology Office of Saline Water In fiscal year 1982 the Bonneville Power Administration became part of the In January 1996 the Bureau of Mines was abolished, and some of its activities were transferred to the Bureau of Land Management, the Geological Survey, and the As of 1985 the Office of Water Research & Technology has been combined with the Geological Survey. 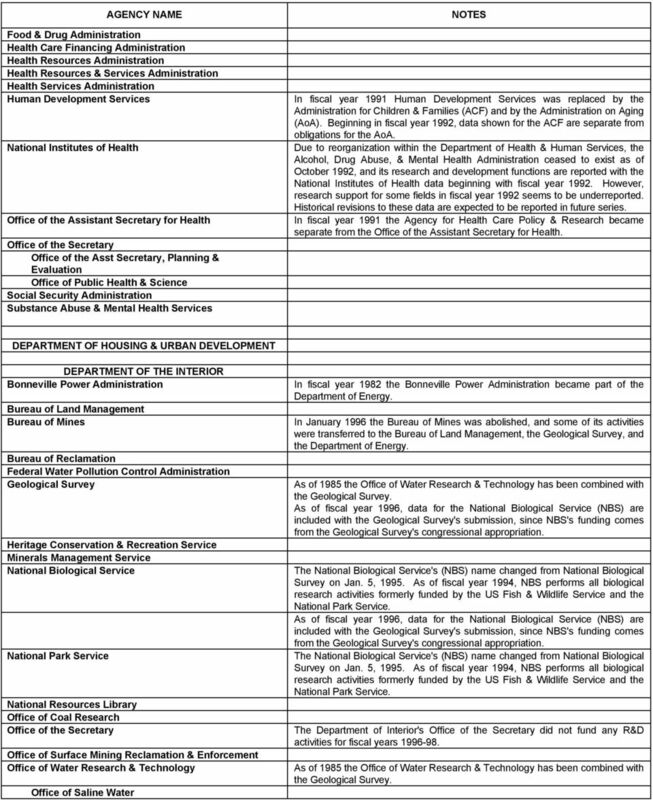 As of fiscal year 1996, data for the National Biological Service (NBS) are included with the Geological Survey's submission, since NBS's funding comes from the Geological Survey's congressional appropriation. The National Biological Service's (NBS) name changed from National Biological Survey on Jan. 5, As of fiscal year 1994, NBS performs all biological research activities formerly funded by the US Fish & Wildlife Service and the National Park Service. As of fiscal year 1996, data for the National Biological Service (NBS) are included with the Geological Survey's submission, since NBS's funding comes from the Geological Survey's congressional appropriation. The National Biological Service's (NBS) name changed from National Biological Survey on Jan. 5, As of fiscal year 1994, NBS performs all biological research activities formerly funded by the US Fish & Wildlife Service and the National Park Service. The Department of Interior's did not fund any R&D activities for fiscal years As of 1985 the Office of Water Research & Technology has been combined with the Geological Survey. 5 Office of Water Resources Research United States Fish & Wildlife Service Bureau of Commercial Fisheries Bureau of Sport Fisheries & Wildlife DEPARTMENT OF JUSTICE Bureau of Prisons Drug Enforcement Administration Federal Bureau of Investigation Immigration & Naturalization Service Office of Justice Programs Office of Legal Policy DEPARTMENT OF LABOR Bureau of Apprenticeship & Training Bureau of Employment Security Bureau of Labor Statistics Employment Standards Administration Employment & Training Administration Labor-Management Relations & Cooperative Programs Labor-Management Services Administration Occupational Safety & Health Administration Pension Benefit Guaranty Corporation Pension & Welfare Benefits Administration Wage & Hour Division The National Biological Service's (NBS) name changed from National Biological Survey on Jan. 5, As of fiscal year 1994, NBS performs all biological research activities formerly funded by the US Fish & Wildlife Service and the National Park Service. The Bureau of Prisons was formerly listed as the Federal Prison System. 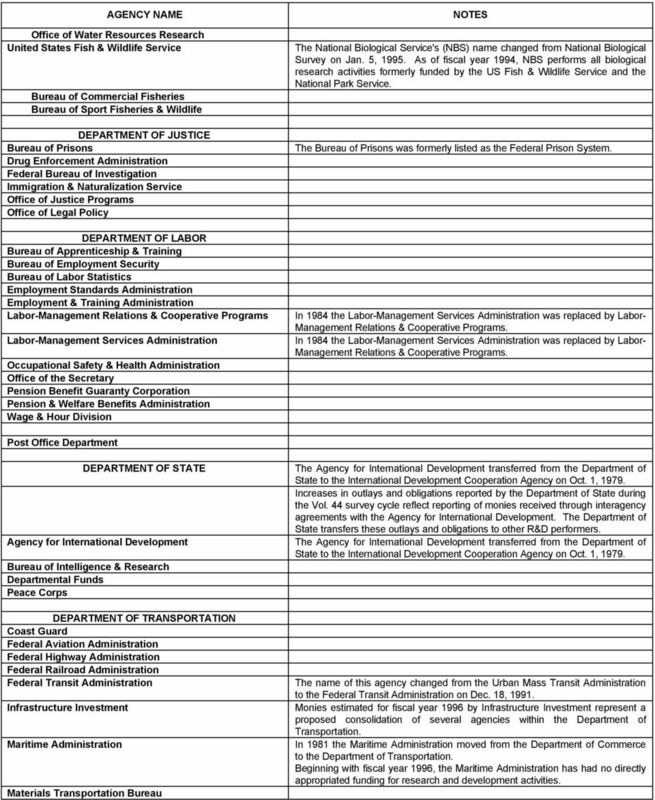 In 1984 the Labor-Management Services Administration was replaced by Labor- Management Relations & Cooperative Programs. In 1984 the Labor-Management Services Administration was replaced by Labor- Management Relations & Cooperative Programs. Post Office Department DEPARTMENT OF STATE Agency for International Development Bureau of Intelligence & Research Departmental Funds Peace Corps DEPARTMENT OF TRANSPORTATION Coast Guard Federal Aviation Administration Federal Highway Administration Federal Railroad Administration Federal Transit Administration Infrastructure Investment Maritime Administration Materials Transportation Bureau Increases in outlays and obligations reported by the Department of State during the Vol. 44 survey cycle reflect reporting of monies received through interagency agreements with the Agency for International Development. The Department of State transfers these outlays and obligations to other R&D performers. The name of this agency changed from the Urban Mass Transit Administration to the Federal Transit Administration on Dec. 18, Monies estimated for fiscal year 1996 by Infrastructure Investment represent a proposed consolidation of several agencies within the Department of Transportation. In 1981 the Maritime Administration moved from the Department of Commerce to the Department of Transportation. Beginning with fiscal year 1996, the Maritime Administration has had no directly appropriated funding for research and development activities. 6 National Highway Traffic Safety Administration Research & Special Programs Administration DEPARTMENT OF THE TREASURY Bureau of Alcohol, Tobacco, & Firearms Bureau of Engraving & Printing Financial Crimes Enforcement Network Internal Revenue Service Office of Thrift Supervision United States Customs Service United States Mint United States Secret Service Due to the reorganization of the Internal Revenue Service and subsequent unavailability of data, fiscal year 1992 figures are taken from estimates made in the Vol. 41 submission. Large changes in obligations reported by the Internal Revenue Service for Vol. 44 are due to shifts in research funding. In 1989 the Federal Home Loan Bank Board was replaced by the Office of Thrift Supervision. In 1990 the Office of Thrift Supervision became part of the Department of the Treasury. The United States Secret Service was formerly listed as the Office of Protective Research. DEPARTMENT OF VETERANS AFFAIRS OTHER AGENCIES ACTION Advisory Commission on Intergovernmental Relations Appalachian Regional Commission Atomic Energy Commission Civil Aeronautics Board Civil Service Commission Community Services Administration Consumer Product Safety Commission Energy Research & Development Administration Energy Security Trust Fund Environmental Protection Agency Federal Communications Commission Federal Emergency Management Agency Defense Civil Preparedness Agency National Fire Prevention & Control Administration Federal Energy Administration Federal Trade Commission Foundation for Educational Assistance General Services Administration International Development Cooperation Agency Agency for International Development In 1977 the Energy Research & Development Administration became part of the Functions for the Defense Civil Preparedness Agency transferred from the Department of Defense to the Federal Emergency Management Agency on July 20, Functions for the National Fire Prevention & Control Administration transferred from the Department of Commerce to the Federal Emergency Management Agency as of Apr. 1, Functions for the Defense Civil Preparedness Agency transferred from the Department of Defense to the Federal Emergency Management Agency on July 20, Functions for the National Fire Prevention & Control Administration transferred from the Department of Commerce to the Federal Emergency Management Agency as of Apr. 1, The 1983 Budget of the United States Government proposed that the Department of Education be replaced by the Foundation for Educational Assistance. As of 1985 the National Archives & Records Administration is separate from the General Services Administration. Note 2: The US State Department will be represented by a high ranking senior diplomat to recruit ALL majors for Foreign Service careers.